Power Plant is the fourth level of Sonic Heroes. In the midst of Eggman-occupied Grand Metropolis, this giant energy installation generates power for the city (and profits for HEXAeco). Cyan power-walkways are still needed to get from A to B, but the Teams also find themselves sprinting around rotating lifts and blasting out of spherical rooftop installations here! While Team Sonic's main objective is to make a beeline for Eggman and stop his plans at the source, the heroes can't ignore a city under occupation, and continue their quest to liberate Grand Metropolis by clearing out the Power Plant. Team Dark has similar objectives (if for different motivations - chiefly, Omega's desire to smash as many Eggman robots as possible). Team Rose continues Amy's unswerving pursuit of Sonic, while Team Chaotix is given a rather odd task by their client: destroy three Gold Camerons, which "control the system of the city itself". Eggman's sabotage of his own forces is presumably a means of delaying the fake Eggman. 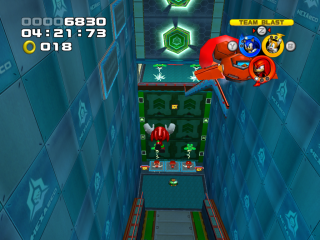 At the end of the level Team Sonic and Team Dark must escape the rising energy in the Power Plant. 45,000 40,000 35,000 30,000 <30,000 Escape from the chaotic plant! 72,000 62,000 52,000 42,000 <42,000 Escape from the chaotic plant! 45,000 40,000 35,000 30,000 <30,000 Escape from the energy plant! 45,000 40,000 35,000 30,000 <30,000 Defeat the 3 gold turtle robots! 40,000 35,000 30,000 25,000 <25,000 Get to the Goal Ring within 9 minutes! 7:00 8:00 9:00 10:00 >10:00 Defeat 100 enemies! 3:30 4:00 5:30 7:00 >7:00 Collect 200 rings! 40,000 35,000 30,000 25,000 <25,000 Defeat the 5 gold turtle robots! The graphical glitches occur the same way as Grand Metropolis on the Xbox version of the game. This is one of two stages in Sonic Heroes that does not have Egg Pawns in them. The only other one is Lost Jungle. The 2nd Goal ring for Team Rose is placed by the entrance to the rising energy chamber which isn't reachable unless cheats are used. This page was last edited on 8 April 2018, at 07:45.